The girls approached the season with a lot of expectation, even though they were a very young team. 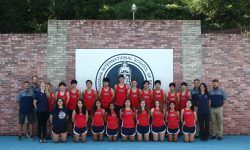 Despite their youth, the girls performed extremely well throughout the season, defeating Seoul American High School for the first time in YISS cross country history. This was a huge accomplishment for the girls and the program as a whole. Four girls: Colleen Vought, Hannah Parrish, Sara Lee, and Sarah Chey, were added to the top ten runners in Guardian history. All of them are 9th or 10th graders. All four of them, along with junior Subin Yang, traveled to Guam for the API meet. The future of the girls team is bright.